Download Chess 2012 game for PC. 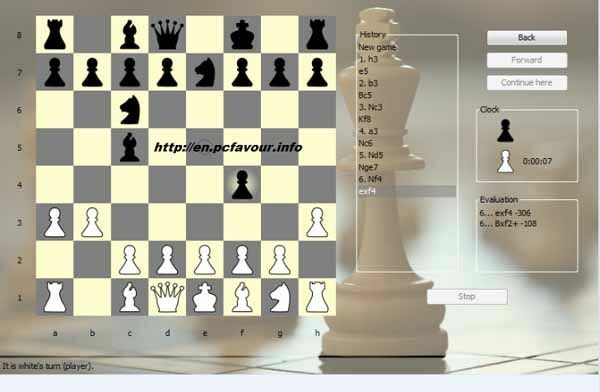 It is a free edition for chess game lovers. It is developed by Filip Hoper. You’ll find it a very easy and light game. Chess is very famous game in the whole world, it is said that this is the Kings’ game. It is very ancient game and it sharps your mind. It enhances your will power and improves your thinking skills and qualities. Chess 2012 is for all type of users either he is a beginner or an expert. It has a bunch of features in it like; you can undo and redo your moves, it shows your current locations in the units of Centipawns and 1 pawn is equal to 100 points in which the positive values shows that it is in favor of white player and negative indicates its opposite. You have to select your player of chess which you want to move and then drag him to your desired position. Chess 2012 will also give you complete help and game rules if you are a beginner. You just need to concentrate on Chess board and learn how to take a step. Understand the situation and according to that take your steps. You can also set your difficulty level if you find it more difficult. It has a modern user interface. You can save and then load the game too. Time can also be set and win a bonus per move. You can also set the board against your friend. The computer next expected moves can also be check and then you can set your move according to that moves.